Finally, a moist fudgy brownie that tastes like a doughnut and looks like it belongs in the most exquisite of bakeries. This simple recipe is easy to follow, delicious to eat, and an easy way to impress! 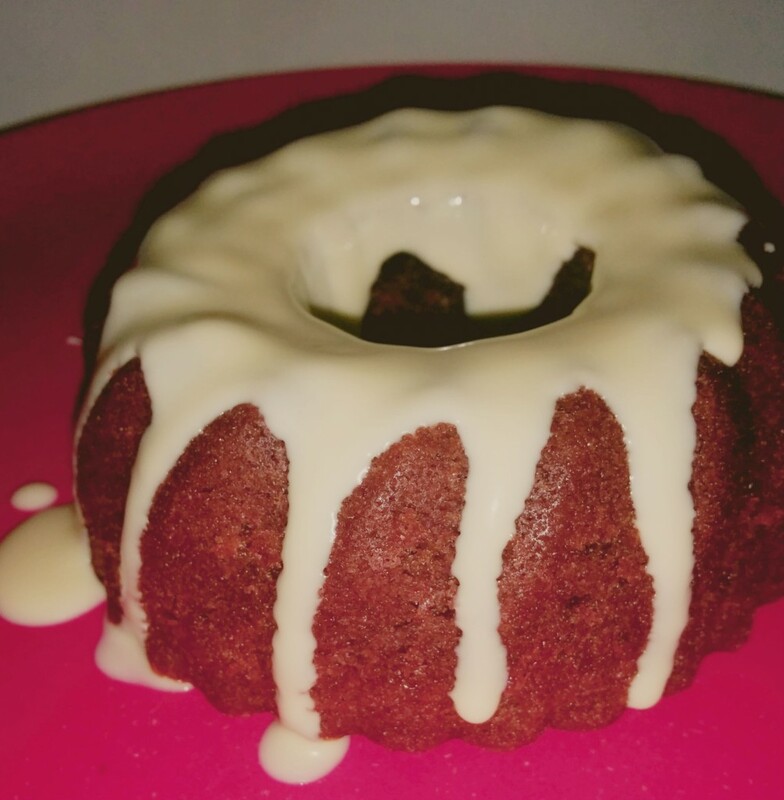 For this picture we used Mini Bunt Cake pans. However you could just as easily use a 8×8 pan for square brownies. The only change would be needing to triple the White Chocolate Glaze recipe to cover the brownie tray. Optional: Muffin Tins will shorten your baking time, however you do need to keep a closer eye on your brownies. Depending on your Muffin Tin you may also need to find a larger second baking pan than the above 9×13 rectangle for the following steps. 1. Gather all ingredients needed. 2. If using eggs, crack all 3 eggs in a bowl and whisk enough to break the yolks. 3. In a large mixing bowl combine brownie mix, coconut oil, eggs, and water. Using an an electric mixer beat for about 30 seconds until ingredients come together. If mixing by hand, some people find it easier to warm the coconut oil in the microwave for 10 seconds on power level 70 to soften it; this will make it easier to combine. 4. Pour into the GREASED 8×8 baking pan or muffin tin. 5. Pour into a greased 8×8″ square baking pan and set into the larger baking pan. Pour enough hot water into the larger baking pan to come up 1″ up the side of the square pan. 6. Place both pans into the preheated oven. The best way to tell if your brownies are done is by inserting a tooth pick into the center, if it comes out clean it’s done and you will have more cake like brownies. If it comes out with a little bit of batter you’re going to have fudgier brownies. 1. Break apart the Ross White Chocolate into a microwave safe bowl. Add the coconut oil. 2. Microwave for 10 seconds on power level 70 . Stir. Repeat x 2 stirring between each microwave. Your chocolate should be melted by now, if there are little chunks stir the chocolate mixture until they melt. DO NOT continue to microwave past this point as it is very easy to burn this chocolate. When brownies have cooled to the touch, pour melted chocolate over top and voila! You’ve got yourself a delicious dessert that is sure to please the pickiest of eaters! *Notes, Ross Chocolate contains Maltitol, which is known to have slightly laxative effects if consumed in excess. If you find you are senstive to this chocolate, any of our other chocolates including: ChocoPerfection , Rene Rey, or Lily’s Chocolates would work in its place.